Sarah Walton, studied Fine Art at Chelsea School of Art, she then trained and worked as a nurse for six years before studying ceramics at Harrow School of Art and serving apprenticeships with Bernard Leach and Zelda Mowat. 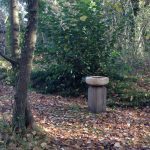 Her work is salt glazed, and she has recently concentrated on sculptural pieces designed for use outdoors – bird baths being a particular speciality. ‘These birdbaths derive from a great love of landscape and the man-made cairns that feature in hills and mountains. Tibetan stupas are cairn-like shrines and I remember also being struck by photos of those. 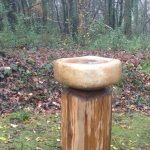 Romanesque fonts and the sculptures of the Romanian artist Brancusi also played a part in their evolution’, she explains. Contemporary Arts Society, London. City Museum & Art Gallery, Stoke-on-Trent. Newport Museum, Gwent, Wales, Arts Centre, University of South Wales, Aberystwyth, Glasgow Museum, Scotland, San Angelo Museum of Fine Arts, Texas, USA and Sainsbury Centre, University of East Anglia.